Shares of oil and gas companies were among the nine stocks that withstood the selloff, after a finance ministry source`s comments on subsidies. Hindustan Petroleum Corp Ltd was reportedly the top percentage gainer at 16.2 percent. Indian shares plunged more than 2 pct on Thursdayday, at their lowest closing levels since April, mirroring the markets rout across the globe amid rising trade concerns and expectation of rate hikes in the United States, said a Reuters report, adding that shares of oil and gas companies were among the nine stocks that withstood the selloff, after a finance ministry source`s comments on subsidies. Hindustan Petroleum Corp Ltd was reportedly the top percentage gainer at 16.2 percent. 16.15 pm: The BSE Sensex slumped over 750 points to end at a six-month low and the Nifty ended below the 10,300 mark today as global indices witnessed across-the-board losses after investor sentiment was hit by heavy sell-off in world markets, said a PTI report, adding that continuous outflows by foreign funds also added to investor woes. The NSE Nifty, however, settled at 10,234.65, down 225.45 points, or 2.16 per cent. It moved between 10,138.60 and 10,335.95 in day trade. "The market sell-off is part of the global sell off triggered by the sharp cut in the mother market US," VK Vijayakumar, Chief Investment Strategist at Geojit Financial Services, told PTI. Meanwhile, foreign portfolio investors (FPIs) offloaded shares worth Rs 1,096 crore, while domestic institutional investors (DIIs) purchased shares worth a net Rs 1,893 crore Wednesday, provisional data reportedly showed. 15.50 pm: Sensex plummets 759.74 points to end at 34,001.15, while Nifty slumps 225.45 points to 10,234.65. In the early trade today, the BSE benchmark Sensex crashed over 1,000 points to slip below the key 34,000-mark, tracking a global sell-off. 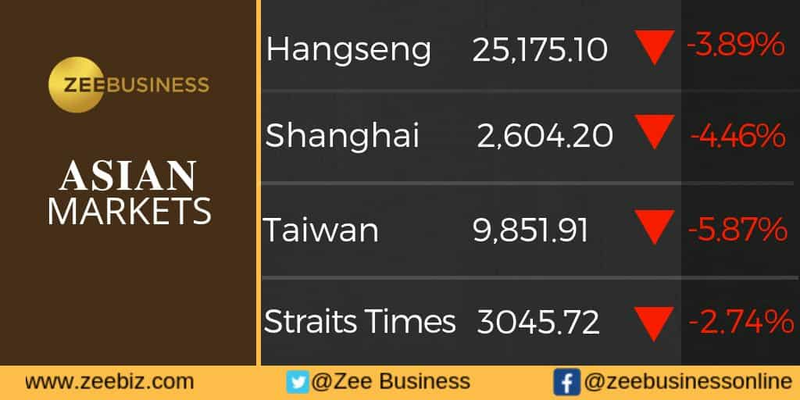 Led by the sharp carnage in equities, the market capitalisation of BSE-listed companies slumped Rs 3,05,625.87 crore to Rs 1,35,59,695.82 crore in late morning trade. 15.35 pm: Chinese stock markets plunged to their lowest levels in four years on Thursday following a global rout, with shares in around 1,000 firms falling to their daily limit of 10 per cent, said an AFP report, adding that Shanghai fell 5.22 per cent, or 142.38 points, to 2,583.46, marking the lowest level since November 2014. The Shenzhen Composite Index, which tracks stocks on China's second exchange, plummeted 6.45 per cent, or 89.15 points, to 1,293.90 -- its lowest point since September 2014, AFP added. 15.20 pm: Attributing the slump in stock and currency markets to external factors, a finance ministry official today said more steps will be taken to check current account deficit (CAD) and hoped that the rupee would appreciate, said a PTI report. "What happened in US yesterday had a ripple effect here today. The IMF has downgraded global growth rate, US growth rate for next year, both these had impact on markets," the official told reporters, adding "Rupee, Balance of Payments, CAD are the main worries, we have strategy in place to tackle situation. We will take action at opportune time on these issues," the official said. 15.05 pm: European stocks slumped to a more than an 18-month low on Thursday after Wall Street`s worst losses in eight months triggered a surge of global selling that knocked over Asia too, said Reuters report, adding that losses in London, Paris and Milan were already climbing towards 2 percent in early trading, although the selloff wasn`t quite as dramatic as the overnight session in Asia. MSCI`s broadest index of Asian shares not including Japan ended down 3.6 percent, having struck its lowest level since March 2017, while China`s main indexes had slumped over 5 percent, the report added. 14.50 pm: Oil prices slumped to two-week lows on Thursday as global stock markets fell, with investor sentiment made more bearish by an industry report showing US crude inventories rising more than expected, said a Reuters report, adding that Brent crude fell $1.74 a barrel to a low of $81.35, its lowest since Sept 27, before recovering a little to trade around $81.70 by 0850 GMT. 14.40 pm: Gold advanced by Rs 130 to Rs 31,980 per 10 gram on Thursday following uptick in festive season demand from jewellers and retailers at the domestic spot market despite a weak global trend. However, silver met with resistance at prevailing levels and declined by Rs 200 to Rs 39,000 per kg, according to a PTI report. Globally, gold fell 0.15 per cent to USD 1,193.60 an ounce in Singapore. Silver too eased 0.14 per cent to trade at USD 14.34 an ounce, while in the national capital, gold of 99.9 per cent and 99.5 per cent purity rose by Rs 130 each to Rs 31,980 and Rs 31,830 per 10 gram, respectively, the report added. 14.20 pm: A stock market rout that started on Wall Street rolled through Asia, driving China's benchmark to a four-year low on Thursday and knocking down indexes in Japan, Korea and Australia, said an AP report. The Shanghai Composite index plunged 5.2 per cent to its lowest level since November 2014 and Japan's Nikkei 225 fell by an unusually wide margin of almost 4 per cent. Markets across Southeast Asia recorded similar declines, the repport added. 13:26 pm: Both the indexes manage to reverse some of their losses - Sensex was trading at 34,237.71 down by 523.18 points or 1.51%, whereas the Nifty 50 was below 153.15 points or 1.46% trading at 10,306.95. 13.20 pm: China's benchmark Shanghai Composite Index dived to near four-year lows on Thursday, joining a global equities rout after a tech sell-off battered Wall Street overnight, said a Reuters report, adding that investors sold across the board amid a confluence of factors, including rising interest rates in the United States, a heated Sino-U.S. trade battle as well as IMF warnings about global financial stability and growth risks. The Shanghai Composite slumped more than 6 percent before recouping some ground to end the day down 5.22 percent at 2,583.46 points, levels not touched since Nov. 25, 2014. It was the index`s worst day since Feb. 25, 2016, it added. 13.10: European shares fell to their lowest level in more than 20 months on Thursday following a rout on Wall Street as jitters over rising US Treasury yields sparked a broad selloff of risky assets, said Reuters report, adding that all sectors in Europe were trading in the red, with tech stocks bearing the brunt of the selling pressure after the big US technology stocks that have been the driving force behing a multi-year bull market posted heavy losses overnight. Europe`s tech index fell 2.4 percent, even though Ingenico rallied 8.5 percent after Natixis said it was examining a merger of its payments activities with the financial and payments firm, it added. 12.45: Oil fell to two-week lows on Thursday as it extended losses from the previous session amid a rout in global stock markets, with prices also hit by an industry report showing US crude inventories rose more than expected, said a Reuters report. Supply worries also eased as Hurricane Michael likely spared oil assets from significant damage as it smashed into Florida, even as it caused at least one death and widespread destruction, it added. 12.40 pm: Share markets in Asia plunged to a 19-month low on Thursday after Wall Street`s worst losses in eight months led to broader risk aversion, a rise in market volatility gauges and concerns over overvalued stock markets in an environment of rapidly rising dollar yields, said a Reuters report. MSCI`s broadest index of Asia-Pacific shares outside Japan was off 3.8 percent around 0500 GMT, and earlier touched its lowest level since March 2017, the report said, adding markets in Europe are seen as unlikely to stem the bleeding, with financial spreadbetters expecting London`s FTSE to open 1.4 percent lower at 7,047, Frankfurt`s DAX to open down 1.8 percent at 11,501 and Paris` CAC to open down 2.1 percent at 5,096. 12.20 pm: The Federal Reserve`s policy rates are "in a good position" after several hikes and the central bank doesn`t need to do much more to normalise its once ultra-easy policy, St. Louis Federal Reserve Bank President James Bullard said on Thursday. A Reuters report quoted him as saying: "With respect to the normalisation, we have already reached a point when policy rates are in a good position," adding "We don`t need to do much more to normalise policy." 12.10 pm: Some spectacular statistics show that the Sensex has suffered terribly and that investors have lost a massive amounts of money. Not just that, the future looks bleak as there seems to be no end in sight to the market mayhem. In one month, Sensex has lost 4,368 points and Rs 1827988.58 crore market cap! 12:08 pm: The Sensex did reverse its losses, and was trading at 34,045.46, below by 715.43 points or 2.06%, whereas the Nifty 50 also followed the same movement and was trading at 10,237.45 lower by 222.65 points or 2.13%. 11.48 am: Airline stocks surged up to 7.4 per cent after the government cut excise duty on jet fuel to 11 per cent to give relief to the aviation industry. 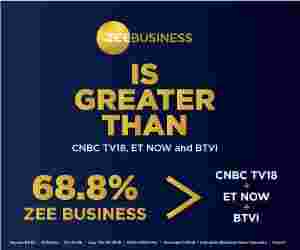 Shares of InterGlobe Aviation zoomed 7.44 per cent, Jet Airways soared 4.70 per cent and SpiceJet 4.69 per cent on BSE. After petrol and diesel, the government Wednesday cut excise duty on jet fuel to 11 per cent to give relief to the aviation industry that has been hit hard over recent weeks by rising fuel prices and plummeting rupee. 11.40 am: The rupee plumbed new lows and stock markets fell deeper into the red for the year on Thursday, rocked by sell-offs across global markets spooked by escalating global trade tensions and warnings of a growth slowdown, said Reuters report. The Indian rupee fell to 74.4850 per dollar levels in early trade, off 0.4 percent on day. The currency is down more than 14 percent this year, making it the worst performer in Asia, it added. 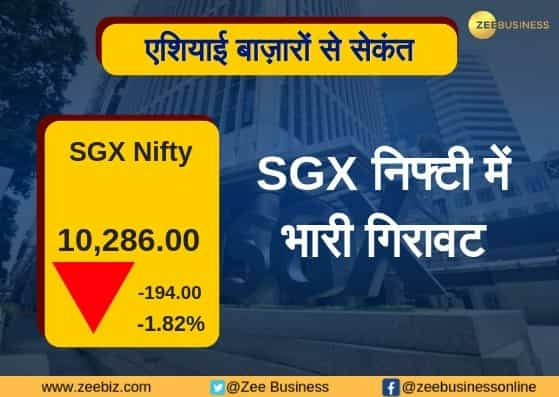 Earlier in the day SGX Nifty fell by 194 points (-1.82%), giving a window into how the Indian markets will likely open later. On its part, the Idnian rupee Thursday weakened by 24 paise to hit another low of 74.45 against the US dollar on strong demand for the US dollar from importers amid unabated foreign fund outflows and a sharp losses in the domestic equity market. At the Interbank Foreign Exchange (forex) market, the domestic currency opened weak at 74.37 and slipped further to quote at an all-time low of 74.45, depreciating 24 paise against the US dollar in the early trade. US President Donald Trump said that Wednesday`s stock market sell-off was in fact a long-awaited "correction," and that the Federal Reserve, which has been raising U.S. interest rates, had gone "crazy." Trump`s use of the word correction to describe the sell-off could be significant. A stock market correction is defined as a decline of at least 10 percent from the high point of the past 52 weeks, suggesting that major U.S. indices have further to fall. Despite Wednesday`s sell-off, the S&P 500 would still need to more than double its losses. It has fallen nearly 5 percent from its all-time closing high on Sept. 20. The Nasdaq has fallen 8.5 percent from its record closing high on Aug. 29. An additional 1.5-percentage-point fall would confirm a correction for that index. Stocks have sold off in recent days on worries about higher borrowing costs. A spike in Treasury yields and solid US economic data have sparked concerns that the Federal Reserve may pick up the pace of its interest rate hikes. Attractive valuations, along with a stable rupee and expectations of a healthy second quarter earning results, had pushed the key domestic equity indices higher on Wednesday. Healthy buying in banking, capital goods and automobile stocks, coupled with the hopes of revival of the non-banking financial companies (NBFCs) enhanced investors` risk-taking appetite. The Sensex was up by 461.42 points or 1.35 per cent at the Wednesday`s closing. In the day`s trade, the barometer 30-scrip sensitive index had touched a high of 34,858.35 points and a low of 34,346.50 points. 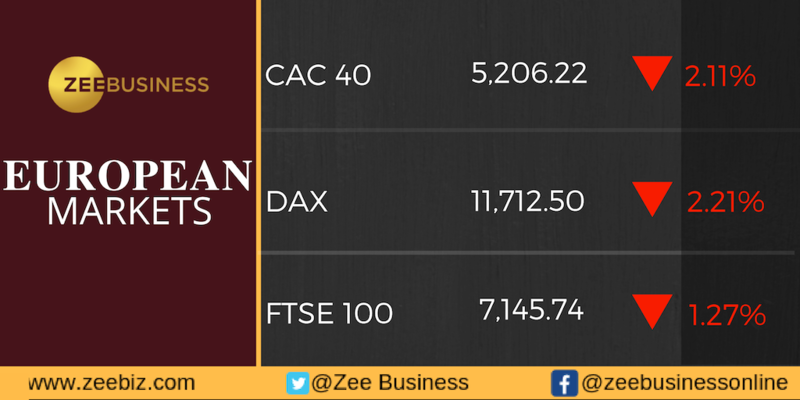 The Nifty50, was up by 159.05 points or 1.54 per cent.